Remember last summer when Republicans in Congress tried three different ways to pass an Obamacare repeal that would take millions off health insurance? Remember how they failed, but then kind of succeeded in the tax bill when they managed to repeal the individual mandate? And remember how funding for the Children’s Health Insurance Program (CHIP) that covers nine million kids ran out about 100 days ago, mostly because Republicans couldn’t decide exactly how they wanted to use it as a bargaining chip? Republican leaders had spent Wednesday pressuring Democrats to vote for the spending bill, arguing that opposing it would effectively block a six-year extension of the children’s health program, attached to the spending bill as a sweetener for lawmakers in both parties. Speaker Paul D. Ryan of Wisconsin said on Wednesday that it would be “unconscionable” for Democrats to oppose funding for the Children’s Health Insurance Program with a “no” vote on the short-term spending bill. 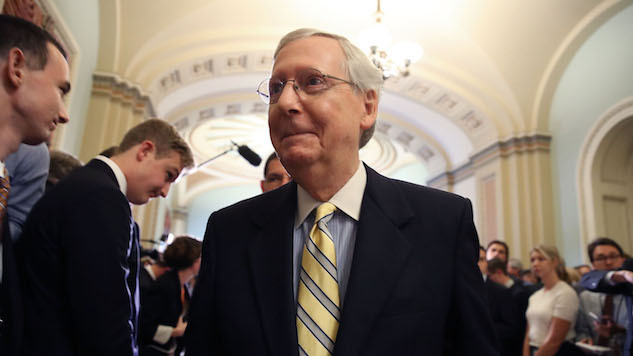 Senator Mitch McConnell, Republican of Kentucky and the majority leader, continued to press Democrats to support the stopgap bill, citing their professed support for extending funding for the Children’s Health Insurance Program. “I’m more than puzzled why they would threaten to turn their backs on those children and shut down the government while they’re at it over the entirely unrelated issue of illegal immigration,” Mr. McConnell said. “I feel that it makes no sense for Democrats to try and bring us to a shutdown, to try and cut off CHIP funding for the states that are running out of money, like Minnesota and Washington and Kentucky and other states,” Mr. Ryan said. There are a few reasons why Democrats don’t want to support this bill—and apparently will not, as it currently stands—but the main one, as McConnell alluded to, was the fact that the bill contains no resolution to the immigration policy known as the Deferred Action for Childhood Arrivals (DACA), which safeguard the citizenship of the “dreamers” who were moved to the U.S. as children. Those immigrants are no longer officially protected after Trump rescinded the Obama-era policy that shielded them from deportation. Dylan Scott at Vox has a thorough breakdown of exactly Republicans are using CHIP as a political hostage. House Republicans in November actually passed an extension that included cuts to Obamacare and Medicare in order to pay for the program, but after the individual mandate was destroyed in the tax bill, extending CHIP for six years no longer cost millions—it was free. It’s now within the GOP’s power to pass a permanent extension, but as they themselves have admitted, that removes their power to use the program as a bargaining chip every few years. Interviews with several sources who know the program and the political dynamics around it say what many Republicans will not out loud: Some in their party, particularly archconservatives in the House, have deeply ambivalent feelings about CHIP, and if they are going to extend it, they want spending cuts to Obamacare or Medicare in return, as the CHIP extension that the House muscled through in November did. There are quotes from senators like John Kennedy (R-LA) admitting they see it as a leverage tool, but on a deeper level, it appears their true concern is that CHIP serves higher income people than programs like Medicaid. After all, if the middle class starts understanding the value of an “entitlement” like CHIP, they may start asking why the GOP is trying to cut Medicaid and Obamacare too. And Republicans cannot afford that kind of solidarity with America’s poor—it could give the social safety net a lasting legitimacy that goes against everything they believe. The White House has since attempted to walk it back, but it’s yet another indication of the complete mess being made of our government.